Family physician at the Queen Charlotte Medical Clinic in British Columbia and Clinical Assistant Professor in the Faculty of Medicine at the University of British Columbia. Public health nurse in Queen Charlotte. Northwest Medical Health Officer at Northern Health in Terrace, BC. Chief Medical Health Officer at Northern Health in Prince George, BC. Objective To present characteristics of and response to a large outbreak of pertussis on Haida Gwaii, BC, in 2014. Setting Haida Gwaii, a remote island archipelago located 100 km off of British Columbia’s west coast. Participants All patients presenting with symptoms evaluated for pertussis on Haida Gwaii between February and August 2014. Main outcome measures The primary outcome measures included the demographic characteristics, time course, and morbidity of the outbreak. The secondary outcome measures included the laboratory result reports, the effects on clinician workload, and the treatment and prophylaxis practices. Statistical analysis for significance of pertussis severity and immunization status was performed with a maximum-likelihood framework. Results Between February and August 2014, out of 873 clinical encounters, 579 patients were seen for pertussis-related care. Of these, 260 patients were reported to public health for case identification, contact tracing, and follow-up. There were 123 cases of probable and confirmed pertussis, a case rate of 2795 cases per 100 000 population. Of these 123 cases, 91 had a cough of more than 2 weeks’ duration. A subset of patients presented with mild symptoms, atypical of pertussis. Nasopharyngeal swabs were collected on 221 occasions, 378 antibiotic prescriptions were written, and 248 prophylactic immunizations were given. The odds ratio that previous immunization protected against the development of classic pertussis was 0.23; however, statistical significance was not reached (P = .112). Conclusion Pertussis is resurging. Physicians need to remain vigilant for its characteristic symptoms. Clear and standardized criteria for the declaration of an outbreak should be developed. To contain an outbreak, it is crucial to deploy resources commensurate with disease activity while coordinating public health and primary care. More research into why large outbreaks continue to occur, why endemic rates continue to rise, and how these can be most effectively prevented is essential. Outbreak management in remote communities presents unique challenges: limited health resources, delays with laboratory results, and constrained access to swabs, antibiotics, and vaccines.12 Haida Gwaii is an archipelago 100 km off British Columbia’s west coast. Of the 4400 inhabitants,13 45% of the population is Indigenous. Care is provided in the 2 communities of Masset and the Village of Queen Charlotte, each having a hospital and clinic. Each site is staffed by 3 doctors, a nurse practitioner, and a public health nurse (PHN). Additionally, there is 1 PHN for each of the nearby Haida communities of Old Masset and Skidegate. In 2014, Haida Gwaii experienced a pertussis outbreak with 123 cases of pertussis—a case rate of 2795 per 100 000 population. This report describes the outbreak and the responses to it. Our experience is instructive for communicable disease management in rural, resource-limited areas of Canada. This study was a retrospective review using hospital and clinic records, cross-referenced to a public health (PH) database created during the outbreak for all patients with suspected, probable, or confirmed pertussis as per the BC Centre for Disease Control (BCCDC) guidelines.14 Study participants were all patients with suspected, probable, or confirmed pertussis referred to PH between February 1, 2014, and August 31, 2014. With the index case presenting in Masset on February 24, we chose to review all clinical encounters starting from February 1 to determine if there were patient contacts with potentially unrecognized or early pertussis. Data reviewed included cough characteristics, length of cough, laboratory testing and results, and epidemiologic linkages to known cases. Immunization status of those referred to PH was ascertained from PH records. Additionally, records of all clinic and hospital encounters in this time frame were manually searched for encounters with symptoms potentially consistent with pertussis (prolonged cough, cough quality, case contacts) or for pertussis-related care (eg, results discussion, isolation advice, follow-up). Ethics approval was received from the Northern Health Research Review Committee. To identify patients with suspected, probable, or confirmed pertussis, the BCCDC guidelines14 were used. Suspected: those with cough of any duration with whoop or posttussive gagging. BCCDC—BC Centre for Disease Control. Between February 1, 2014, and August 31, 2014, we identified 873 clinical encounters with 579 patients for whom pertussis was diagnosed or considered in the differential diagnosis. Of these, 260 patients were reported to PH for case identification, contact tracing, and follow-up. All suspected cases were advised to self-quarantine until either testing revealed they did not have pertussis or until 5 days of antibiotics were taken. Of the group referred to PH, 123 cases were diagnosed as either probable (62 of 123 [50.4%]) or confirmed (61 of 123 [49.6%]), a case rate of 2795 per 100 000 population (Figures 1, 2, and 3). The remainder of suspected cases (137 of 260 [52.7%]) were not confirmed to have pertussis by either laboratory or clinical criteria. Most of the diagnosed patients were female (78 of 123 [63.4%]) and younger than age 20 (65 of 123 [52.8%]). 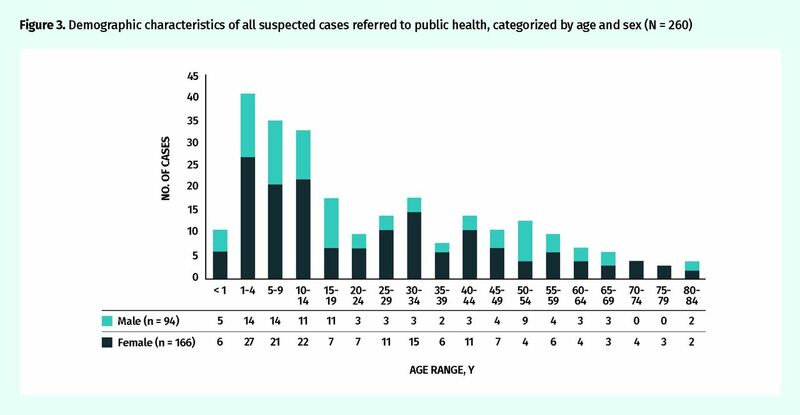 There were 19 cases in the 0-to-4 age group, 17 cases in the 5-to-9 age group, and 29 cases in the 10-to-19 age group. Disease intensity peaked in May when 54 new cases were referred to PH during the first week, with a rapid diminishment of infections thereafter. The last case was diagnosed on July 24. The outbreak was declared over on August 31. All high-risk contacts (infants and pregnant women in their third trimester) were offered antibiotic prophylaxis, consistent with BCCDC guidelines.14 Contacts who were not offered prophylaxis were advised to present immediately at onset of any respiratory tract infection (RTI) symptoms for testing and treatment. The morbidity associated with this outbreak was modest. Six infants were infected; a 2-month-old infant was hospitalized for 2 weeks and recovered without sequelae. There were no other hospitalizations. Several patients were treated for prolonged cough of more than 10 weeks’ duration. There were no encounters for antibiotic-related complications. Local clinician workloads increased substantially over baseline. In Masset, there were 361 encounters related to pertussis between March and May, an increase in encounters of 16.9% for this period (historical mean for this period was 2134). In Queen Charlotte, there were 512 pertussis-related encounters between April and May (mean = 2235), an increase in encounters of 22.9%. One-quarter (209 of 873 [23.9%]) of pertussis-related encounters occurred in the emergency department. An outbreak was declared on May 1, 2014. Subsequently, owing to widespread public awareness, patients presented early with catarrhal symptoms and often a mild cough of short duration—as little as 1 day (Table 1). This made it difficult to make a clinical diagnosis, as symptoms were not present long enough to meet pertussis diagnostic criteria. However, all confirmed cases were known to providers so epidemiologic linkages could be made, guiding testing and treatment decisions despite nonclassic symptoms. Of those cases referred to public health, cough duration at the time of contact with clinician: Data excludes those cases in which the length of cough was not known. Most patients who presented after May 1, 2014, identified some contact with a known case. Many diagnosed with pertussis had milder, atypical symptoms that were not consistent with classic pertussis cough. We evaluated cough characteristics of the subset of probable and confirmed cases (n = 123) with prolonged cough greater than 2 weeks (n = 91). Of this group, 13 (14.2%) had milder symptoms. The remainder (n = 32) were diagnosed in the catarrhal stage or with cough duration of less than 2 weeks, when pertussis often lacks the characteristic whoop, gag, or apnea. These 13 cases were diagnosed based on the confirmation of laboratory results (n = 3), strong epidemiologic linkage (n = 4), and having some case contact and no other likely explanation for cough (n = 6). This latter group reported having brief contact with 1 or more cases known to providers, not meeting criteria for epidemiologic linkage (face-to-face contact > 5 minutes, direct contact with respiratory secretions, or sharing a confined space for > 1 hour). To evaluate whether vaccination was associated with milder pertussis (Table 2), those with known vaccination status and cough for longer than 2 weeks were analyzed in a maximum-likelihood framework using a generalized linear model with a binomial distribution and a logistic link function.15 The odds ratio for previous immunization protecting against the development of classic pertussis was 0.23; however, owing to our small sample size, this did not achieve statistical significance (P = .112; 95% CI 0.012 to 1.337). Thus, we were not able to prove a protective relationship between immunization status and pertussis severity as predicted in the literature.16 Figure 4 shows the estimated probability of having classic versus atypical pertussis symptoms by immunization status with 95% CIs. Illness severity versus known immunization status of all patients: Only cases with a diagnosis of probable or confirmed pertussis and those with a prolonged cough of more than 2 weeks were included in this analysis. 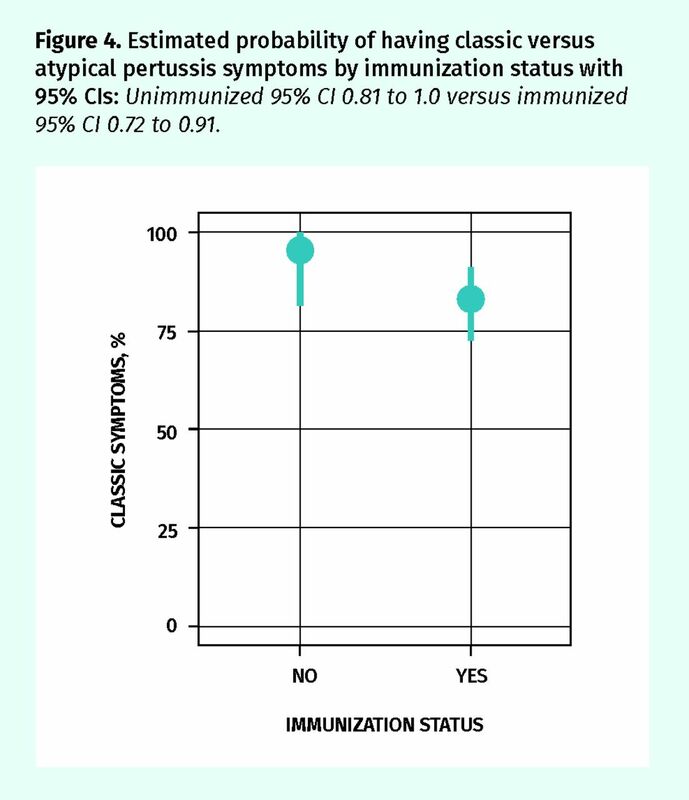 Estimated probability of having classic versus atypical pertussis symptoms by immunization status with 95% CIs: Unimmunized 95% CI 0.81 to 1.0 versus immunized 95% CI 0.72 to 0.91. Nasopharyngeal amies with charcoal pertussis swabs were collected on 221 occasions (74 in Masset, 147 in Queen Charlotte) and shipped via ground and air for processing at the reference laboratory in Vancouver, BC. Polymerase chain reaction (PCR) test results were reported first, testing for the presence of B pertussis DNA, followed by culture results. After the outbreak declaration, pertussis specimens were shipped expedited, improving laboratory reporting by a mean of 1.3 days (Table 3). Swabs were not universally collected: clinicians ran out of swabs on several occasions, and it was not practical to collect swabs for all patients. Besides long reporting delays of laboratory results, challenges with interpreting results arose with many discordant, insufficient, or inconclusive results (Figure 5). These laboratory challenges, combined with the urgency to reduce the spread of pertussis, meant that most patients presenting with RTI symptoms were treated empirically with antibiotics. A total of 378 antibiotic prescriptions were dispensed, most were for azithromycin (360 of 378 [95.2%]), both for empirical treatment and for prophylaxis of high-risk contacts: late-term pregnant women and infants. Cost and macrolide adverse effects were reasons for choosing alternatives to azithromycin. Swab test results (N = 221): All tests were performed with nasopharyngeal amies with charcoal swabs. *Inconclusive: test results are neither positive nor negative. This might be because of sample degradation owing to delays in arrival at the reference laboratory, or a borderline result that does not meet criteria for a positive test result. †Insufficient: human DNA is not found in the specimen, indicating inadequate collection of nasopharyngeal cells. ‡Positive: the PCR results were positive, the culture results were positive, or the results for both PCR and culture were positive. §Discordant: when only 1 of the 2 test results is positive. Thirteen of 39 swabs were discordant (9 swabs revealed positive PCR results and negative culture results; 4 revealed negative PCR results and positive culture results). Public health surveyed encounters daily to identify cases, reinforcing advice for isolation. Symptomatic contacts were identified and brought to clinicians for assessment, testing, and treatment. Public health assisted with identifying epidemiologic linkages. Public health oversaw media releases and communications with school officials. Public health worked with clinicians to standardize more aggressive approaches to testing and treatment. Public health provided 248 vaccinations, targeting high-risk contacts: infants younger than age 1 (32 of 248 [12.9%]) and late-term pregnant women (12 of 248 [4.8%]). Vaccination was administered to health care workers (72 of 248 [29.0%]) and to those with uncertain or remote vaccination status (132 of 248 [53.2%]). The Haida Gwaii outbreak was Canada’s most intense pertussis activity in 2014, with a case rate of 2795 per 100 000 population and 873 pertussis-related clinical encounters. A subset of pertussis patients with prolonged cough (n = 91) presented with milder disease without classic characteristics (13 of 91 [14.3%]). There was a trend toward attenuation of severity with vaccination, consistent with the literature16; however, our sample size was too small for this to be statistically significant. It was clear to providers that pertussis was well established with 50 cases in the 2 months before the outbreak declaration on May 1, 2014. Contributing factors related to delays in recognizing the outbreak included the absence of a local PH epidemiologist, the lack of a centralized communicable disease unit, and vacancies in medical health officer positions. Disease activity diminished rapidly following outbreak declaration owing to enhanced case identification, concerted public communication, improved case isolation, standardization of approaches to empiric treatment and testing, expedited reports of laboratory results, and earlier presentation for care of those with symptoms. For rural clinicians, there are several lessons from this outbreak. 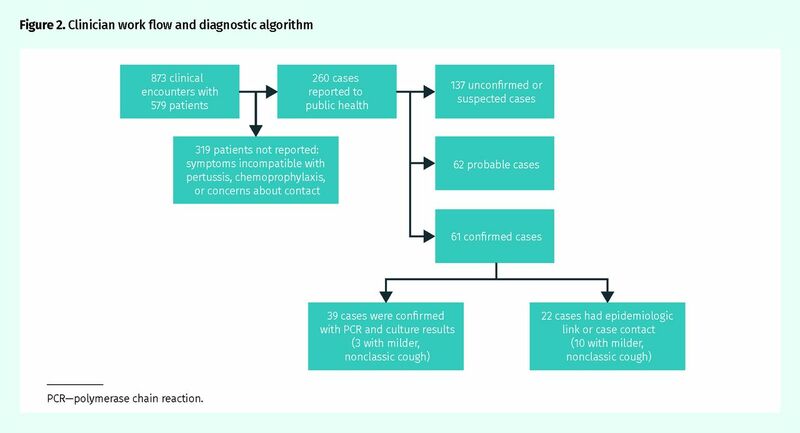 First, clinicians need to communicate early with PH once pertussis is detected to coordinate case management and contact tracing. Physicians must be familiar with case isolation and chemoprophylaxis recommendations. During outbreaks, pertussis vaccination of pregnant women (> 26 weeks’ gestation) and accelerated infant immunization (at 42 days of age) are vital to protect infants, who are at the highest risk of mortality.8 Second, although testing is useful for confirming diagnosis and outbreak management, timely pertussis diagnosis is not assisted by laboratory results, with PCR test results received an average of 7.7 days postcollection. During outbreaks, those with any RTI symptoms (including catarrhal) who are known contacts to pertussis cases must be seen quickly, with empiric treatment and home isolation considered to control the spread of pertussis. Third, clinicians must encourage universal childhood immunization and remain familiar with recommendations on adult and pregnant women boosters. From a PH perspective, consistent criteria should be established defining the threshold for when a pertussis outbreak is declared. Currently each province sets its own criteria, with no harmonization across provinces. We suggest that evidence of ongoing, pervasive, sustained community transmission serves as the basis for declaring a pertussis outbreak. More important, resources need to be deployed to resource-poor areas commensurate with increased disease activity, thus preventing small clusters from becoming outbreaks by coordinating the approach of clinicians, PH, and community partners. As an example of this, in the year following this outbreak, Haida Gwaii experienced a recurrence of pertussis activity, quickly contained with rapid, coordinated intervention by PH. There are several limitations of our study. First, we were unable to determine accurate immunization rates for the population as a whole, in part owing to incomplete records, particularly for adults who might have received their primary series decades ago. Second, laboratory challenges (poor collection technique, sample degradation due to long transport times) meant that our results underrepresent the true rate of pertussis. We were unable to collect swabs on all symptomatic cases. Third, data on disease characteristics were derived from clinical records collected during patients’ illness. If all patients had been contacted at the close of the outbreak, we would have more accurate data on length and severity of cough. Fourth, data limitations in the medical records and provincial immunization database precluded our ability to stratify the analysis by ethnicity. Pertussis is resurging. Physicians need to remain vigilant for its characteristic symptoms.3 Clear and standardized criteria for the declaration of an outbreak should be developed. To contain an outbreak, it is crucial to deploy resources commensurate with disease activity while coordinating PH and primary care. More research into why large outbreaks continue to occur, why endemic rates continue to rise, and how these can be most effectively prevented is essential. ▸ Managing infection outbreaks in remote communities presents unique challenges such as limited health resources and delays with laboratory results. In 2014 a pertussis outbreak occurred in Haida Gwaii, BC; this article describes this outbreak, and the authors’ experience is instructive for communicable disease management in rural, resource-limited areas. ▸ Several factors contributed to the delay in recognizing the outbreak in Haida Gwaii: the absence of a local public epidemiologist, the lack of a centralized communicable disease unit, and vacancies in medical health officer positions. 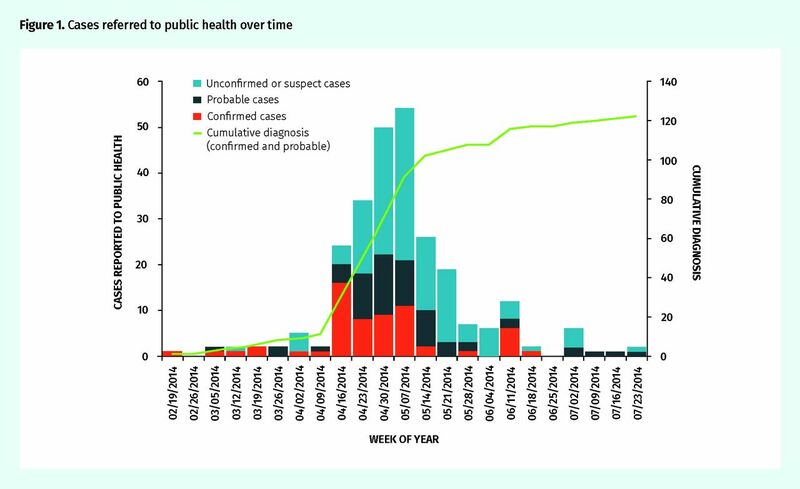 Disease activity diminished rapidly following outbreak declaration owing to various factors including enhanced case identification, concerted public communication, and improved case isolation. ▸ In rural settings where timely laboratory diagnosis is not possible, empiric treatment and home isolation even in the catarrhal stage is essential to control the spread of pertussis. Chemoprophylaxis of high-risk contacts and prophylactic immunization of pregnant women and infants is important to protect those at highest risk of mortality. ▸ L’éclosion d’une épidémie dans une communauté éloignée représente un défi particulier en raison du nombre limité des ressources médicales locales et des délais nécessaires pour obtenir les résultats des examens de laboratoire. En 2014, une épidémie de coqueluche est survenue à Haida Guaii, en Colombie-Britannique; cet article décrit cette épidémie mais aussi les leçons que l’auteur a retenues sur la façon de gérer une maladie contagieuse de cette ampleur dans une région rurale dotée de ressources limitées. ▸ Plusieurs facteurs ont contribué à retarder la reconnaissance de la présence de cette épidémie à Haida Guaii : l’absence locale d’un épidémiologiste de la santé publique, d’une unité centralisée pour les maladies contagieuses, et certains postes vacants chez les fonctionnaires du milieu de la santé. L’intensité de la maladie a rapidement diminué une fois l’épidémie reconnue, grâce à un diagnostic plus rapide, à une bonne communication avec la population et au fait que les malades étaient plus rapidement isolés. ▸ Dans un milieu rural où il est impossible d’obtenir un examen de laboratoire diagnostique en temps opportun, il est essentiel d’entreprendre un traitement empirique et de confiner les malades à la maison si on veut contrôler la propagation de la coqueluche, et ce, même durant la phase catarrhale. Il est également important d’initier une chimioprophylaxie et une vaccination chez les contacts qui présentent un fort risque de mortalité, comme les femmes enceintes et les nouveau-nés. Dr Morton is the principal investigator of this study who completed most of the draft, study design, and oversight; and supervised data collection, data analysis, interpretation, and presentation of this study. Ms Birtwistle is the co-principal investigator of this study who contributed to study design, data collection, and drafting of the manuscript. Dr Fumerton provided a public health perspective and contributed to analysis and data interpretation, as well as manuscript drafting and revisions. Dr Allison provided a public health perspective, and contributed to data interpretation and coordination of resources for this research. All authors approved the final revisions of the manuscript.
. Pertussis surveillance in Canada: trends to 2012. Can Commun Dis Rep 2014;40(3):21-30.
. Pertussis—not just for kids. N Engl J Med 2005;352(12):1215-22.
. Pertussis infection in adolescents and adults: clinical manifestations and diagnosis. Waltham, MA: UpToDate; 2018. Available from: www.uptodate.com/contents/pertussis-infection-in-adolescents-and-adults-clinical-manifestations-and-diagnosis?source=search_result&search=pertussis%20in%20adults&selectedTitle=2~150. Accessed 2018 Jun 4.
. Antibiotic treatment of pertussis: are 7 days really sufficient? Pediatr Infect Dis J 2015;34(4):444-5. Pertussis (whooping cough). Ottawa, ON: Government of Canada; 2014. Available from: www.phac-aspc.gc.ca/im/vpd-mev/pertussis/professionals-professionnels-eng.php. Accessed 2018 Jun 4. Pertussis vaccines: WHO position paper - September 2015. Wkly Epidemiol Rec 2015;90(35):433-58.
. Pertussis across the globe: recent epidemiologic trends from 2000 to 2013. Pediatr Infect Dis J 2015;34(9):e222-32.
. First pertussis vaccine dose and prevention of infant mortality. Pediatrics 2015;135(6):990-9. Epub 2015 May 4.
. The pertussis problem. Clin Infect Dis 2014;58(6):830-3. Epub 2013 Dec 20. BC Centre for Disease Control [website]. Pertussis (whooping cough) vaccines. Vancouver, BC: BC Centre for Disease Control; 2018. Available from: www.bccdc.ca/health-info/immunization-vaccines/vaccines-in-bc/pertussis-whooping-cough-vaccines. Accessed 2018 Jun4.
. Duration of immunity against pertussis after natural infection or vaccination. Pediatr Infect Dis J 2005;24(Suppl 5):S58-61.
. Changing pertussis epidemiology: everything old is new again. J Infect Dis 2014;209(7):978-81.
. 2016 Census profile. Ottawa, ON: Statistics Canada; 2018. Available from: www12.statcan.gc.ca/census-recensement/2016/dp-pd/prof/index.cfm?Lang=E. Accessed 2018 Jun 11.
; BC Centre for Disease Control, editor. Management of specific diseases. Communicable disease control manual. Vancouver, BC: BC Centre for Disease Control; 2011. Available from: www.bccdc.ca/resource-gallery/Documents/Guidelines%20and%20Forms/Guidelines%20and%20Manuals/Epid/CD%20Manual/Chapter%201%20-%20CDC/EPI_Guideline_CDChapt1Pertussis_20100625.pdf. Accessed 2018 Jun 4.
. An introduction to generalized linear models. 3rd ed. Boca Raton, FL: Chapman & Hall/CRC; 2008.
. Vaccinated children and adolescents with pertussis infections experience reduced illness severity and duration, Oregon, 2010–1012. Clin Infect Dis 2014;58(11):1523-9. Epub 2014 Mar 14.
. Trends in pertussis diagnostic testing in the United States, 1990 to 2012. Pediatr Infect Dis J 2016;3:39.
. Survey and rapid detection of Bordetella pertussis in clinical samples targeting the BP485 in China. Front Public Health 2015;3(39).
. Nucleic acid amplification tests for diagnosis of Bordetella infections. J Clin Microbiol 2005;43(10):4925-9. National Advisory Committee on Immunization. Prevention of pertussis in adolescents and adults. Can Commun Dis Rep 2003;29:1-9. Erratum in: Can Commun Dis Rep 2004;30(6):60.
. Prevention of pertussis, tetanus, and diphtheria with vaccines in the United States: recommendations of the Advisory Committee on Immunization Practices. MMWR Recomm Rep 2018 27;67(2):1-44.
. Pertussis: where did we go wrong and what can we do about it? J Infect 2016;72(Suppl):S34-40.
. Pertussis: biology, epidemiology and prevention. Vaccine 2016;34(48):5819-26. Epub 2016 Oct 22.